Summer Fest 2008 07-12-08. Local Northern Californian Hip Hop and R&B Acts Featuring Headliner Mistah Fab. Brought to You by EFFU Promotions and 88 Muzik. On THe Spot Hosted by MC QBall. Filmed and Edited by Matthew Hollstein for 916groove.com. 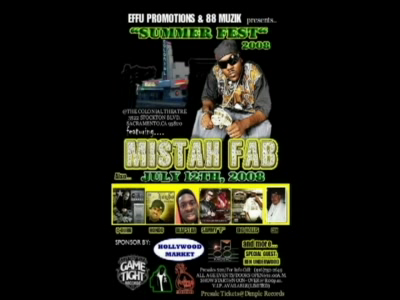 Summer Fest 2008 Commercial. Filmed and Edited by Matthew Hollstein for 916groove.com.